SSU Students Matthew Adiao (Linus), Noah Evans (Charlie Brown) and Emily Rice (Snoopy), perform in Clark Gesner’s award-winning musical "You’re A Good Man, Charlie Brown,"
Directed by SSU’s Doyle Ott (Artistic Director for Oakland’s Children’s Fairyland Theatre), the main-stage production features a cast of six SSU musical theatre students and eight-piece orchestra conducted by Grammy nominated Lynne Morrow. 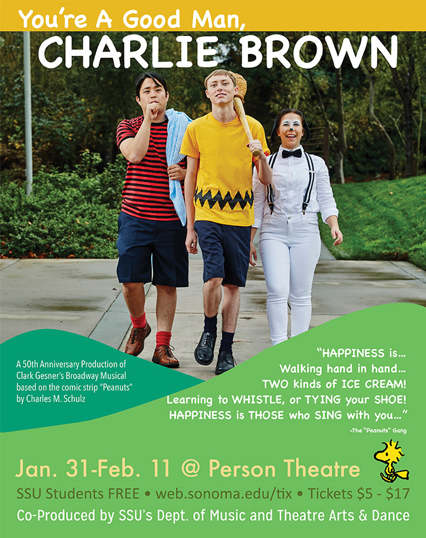 “We’re thrilled to bring this musical to audiences young and old, and to honor the legacy of storytelling Charles Schulz gifted the world; always reminding us to find happiness in the simple things in life,” says Morrow. Sonoma State’s Theatre Arts and Dance Department has been working the past few seasons to expand its children’s theatre audience, and is proud to announce that over 800 Sonoma County elementary school students will attend two K-12 matinees for free. Admission prices range from $5 to $17. SSU students receive two free tickets with valid student ID. Tickets are $10 non-SSU students and seniors; $15 Sonoma State University Faculty and Staff; and $17 standard admission. On special "Friends and Family Nights,” all tickets are $5 with free admission for SSU Faculty, Staff and Alumni. Feb. 1 - 7:30 p.m.
Feb. 2 - 7:30 p.m.
Feb. 3 - 7:30 p.m.
Feb. 7 - 10:00 a.m.
Feb. 8 - 7:30 p.m.
Feb. 9 - 7:30 p.m.
Feb. 10 - 7:30 p.m.